Details Vicenza earth is buff white or tan-colored clay with a subtle, warm hue and low opacity. 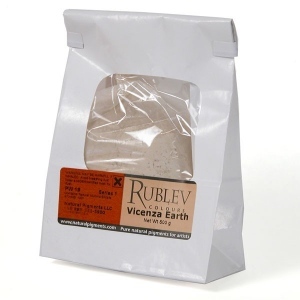 Add Vicenza earth to gesso and chalk ground recipes to make the ground smoother for gilding and painting surfaces. 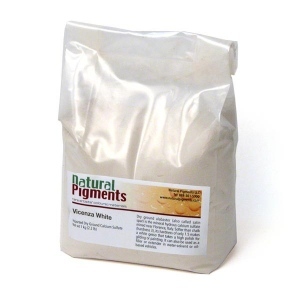 Vicenza earth in paint and bole recipes to replace clay and bentonite. Use it is a useful glazing color to impart warmth to cooler tones. It also provides a delicate cloudiness that can help to soften focus and articulate a sense of space. 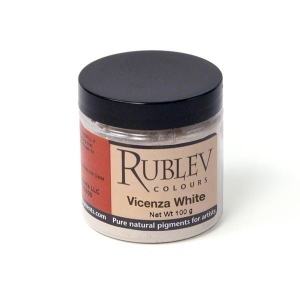 Use Vicenza earth with heavy pigments to prevent separation in oil paint and to give colors a short, buttery consistency.